INTRO: The 1977 Award winning movie titled "Close Encounters of the Third Kind" ref presented as fiction might actually be based on secret history. Credit to Mark Scott for noticing the fiction repeating facts probability connection here some years ago. 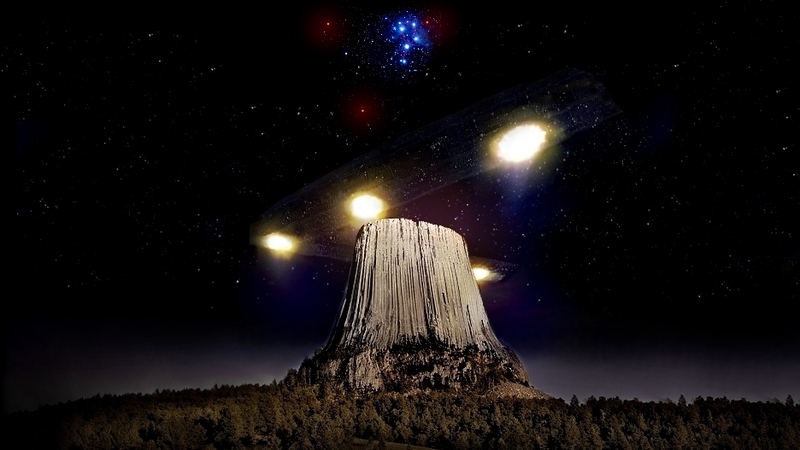 An event shown like in the image above depicts a first contact event with a large UFO with benevolent Human star visitors accompanied by the watchers... the 'Grey' aliens ref at a site known as Devils Tower ref . This movie might have been the first grand scale human experiment by our elite powers that be to firstly cash in on the profitable release of an emotional exciting story of our past and also test public reaction to it while setting up 'protection' for something they felt needed 'protecting'. Protection of what you might ask? Protecting the truth of our amazing past ref that if known and accepted would neutralise the differences in religions, elevate spirituality but more importantly, end all wars. How are they protecting this 'secret' ref ? Protecting hidden sacred truth is best achieved by creating a grand scale global released movie of a fictional account of it. In doing so, if this story were later claimed to be real history it would be attacked along the lines of it is copying a fictional story and be rejected by academia very swiftly. I believe this protocol was also unleashed recently on my own work. 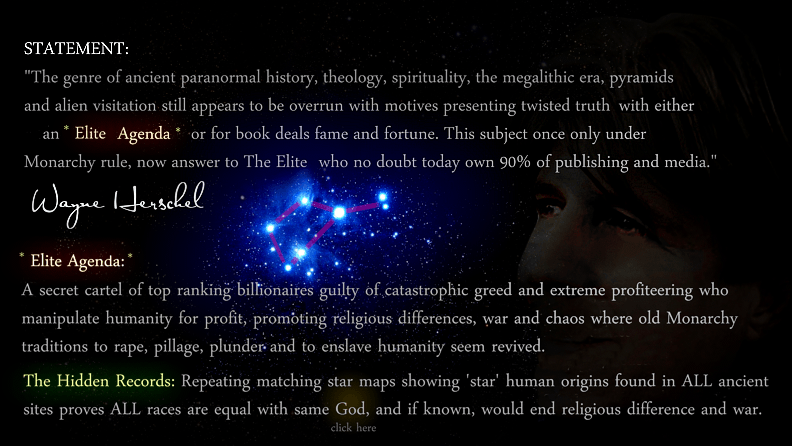 (My entire star map claim was dealt with in this way by a movie called "Prometheus" ref . It fictionalised my real discovery claim: that ancient star maps have been found all around the world that show a star map of our human ancestors, one using the DaVinci Vitruvian man blueprint to encode a message with it. This is sadly what 'paranormal history' is up against and there is little one can do taking on 'the powers that be' in cases that are not crystal clear plagiarism). Hollywood no doubt saw the reaction to the Close Encounters 1977 movie was well accepted and it immediately threw the old theory 'humanity was not ready' for first contact right out the door. At time the movie ran, I remember most believed a future event like this would be great if it ever were to occur and should not just be a secret encounter... it should be made know for all public. Elite society in control no doubt realised this topic was far too well accepted, and probably activated stage two in their 'cover up' protocol. They also probably decided right there and then to make almost every movie from this day forward mandatory supporting an 'evil alien' agenda to start to build a fear of aliens with all humanity. This is a typical conspiracy theory thus far but there is more unfolding here and you need to read further. The history of the first people of North West Wyoming are descendants from the earlier Sioux tribes and are the American Indians known as the Lakota people ref . 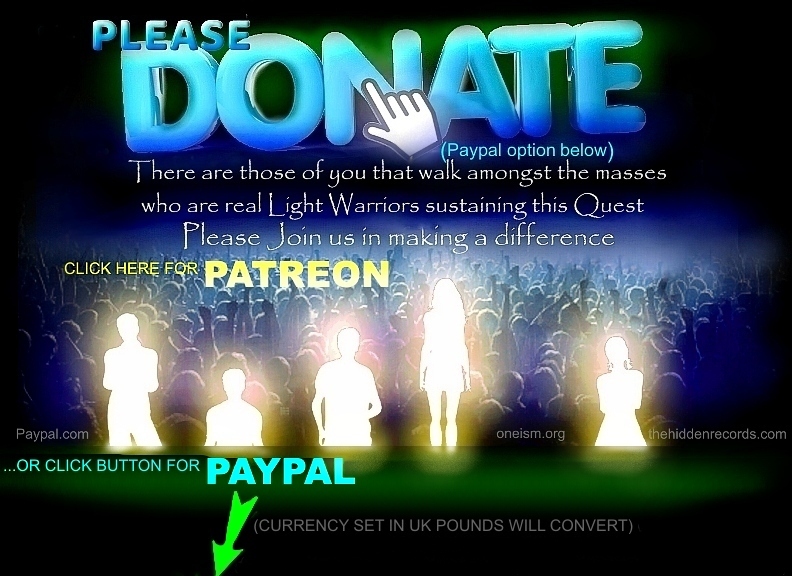 Their beliefs covered in publications are their ancestors were from the stars ref and from the Pleiades ref as per all the American Indian traditions but this tribe has a slightly different legend for their land and something very special around the famous 'Devils Tower' ref natural monolith. Some tribal girls went out to play and were spotted by several giant bears, who began to chase them. They ran through the wilderness until they came upon a large rock. They climbed atop the rock and prayed for their safety. Suddenly the rock rose from the ground towards the heavens. The bears tried to climb the rock and the girls were still in danger. But not for long as they were lifted up to the sky and became stars known as the Pleiades. The deep claw marks in the rock sides you can still see today they say. Some will insist there is little to be learned in this traditional legend narration until you look a little deeper. Firstly they chose girls for representation of the Pleiades. Since the time of Plato the Greeks and all other civilisations personified the Pleiades as all feminine. I tried to visualise the portrayal of this myth to identify the remnants of a wise teaching that might have recently got a little twisted or lost. Firstly we do have something common here that I have found with other ancient civilisations in the genesis of humanity design plan of a sacred site. In Egypt the Obelisk was the monument made earthly as the male anatomy of the Earth so to speak and it was the feminine womb in the sky of the Pleiades 3 suns area just like Washington DC. ref . The Rock monument is of typical monolith upright male anatomy of the Earth here too and my good friend Hungarian researcher Márton Molnár-Göb was quick to point this out. Is it just a Coincidence? Probably not. The symbolism here shouts out there is a typical star visitor teaching resonating an echo with all the other sites... why? How? Because it is a grand teaching possibly that was taught over and over to different people all over the world many millennia ago! A human genesis code obviously resides here! A group of Lakota girls are spoken of and that for me is the first narrative clue that the story is probably something created to teach memory how the Pleiades are important to Lakota sacred feminine ancestor origins as i found globally common ref. A rock monolith transition marker for human beings to rise to the Pleiades from this site to these stars suddenly made more sense. A cosmic conduit transition place here at the monolith from Earth to the place of the ancestors. Originating with a mythology teaching story like interaction with a cosmic monster dragon on Earth that takes one to this place in the sky or when in ritual ceremony veneration on a set night timing event of the place of our ancestors. It teaches a great 'memory tool' with the mythological bear claw lines on the rock. A monolith with aligning striations towards the sky, the only rock of this description here as a sacred communion place. A ritual event no doubt occuring annually ... the very moment when the Pleiades rise over the rock monolith. The important thing for me is that this rock is the 'x' that marks the spot to decipher the land star map... the sketch star map and the unthinkable... the place perhaps due to its geology uniqueness, an active portal electromagnetic leyline hot site to be remembered for a time in the future for a second coming. 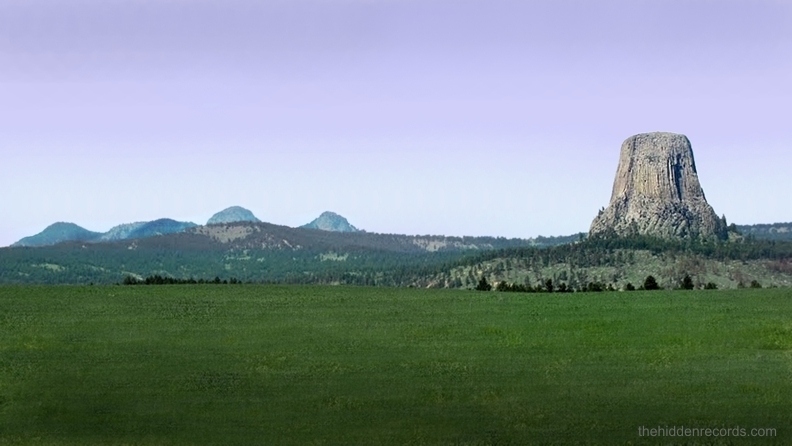 The rock itself was always a sacred rock to the Lakota as well as its nearby hills due to something academics will prefer to omit. Oral tradition is very strong here and most Lakota believe as they have been told by elder to elder over many generations that they themselves have ancestors from this area in the sky. Not just that but they believe the entire area is a mirror of the stars of their sacred part of the sky involving a very mysterious cluster of hills. Recently Márton Molnár-Göb had a friend send him what looked like a historical star map image and asked him to comment on it. Márton had spent some time on another version of this star map and we both know it well but we had both not been able to find the source at all and it could not be verified so we both waited for more research before taking this further forward. But this image had more... it had a ground plan where the sky was depicted matching specific ground details on earth. The first thing Márton did was check Google Earth and see what hills might be nearby. He noticed there were a cluster of hills near the 'Devils' Tower natural formation although all the Google Earth dated images were not great sun angles to identify all the hills. But he knew instantly some hills look perfectly in postion for a correlation pattern we knew well. The image claim qualifying as historical was a big possibility. Márton contacted me and said this story looks obviously real and I should have a look at the hills nearby that he was sure are a good correlation. They are part of the range known as the Black Hills or as he correctly identified them as the Missouri Buttes cluster ref . The image below is my reconstructed version of the most consistent and important details of the original Lakota drawn map by Lakota elders. Márton was first shown this version here ref which is without doubt the better version of all versions to date. There are many variations of the sketch. I cross referenced this one firstly with these two sources here ref and here ref then to gain clarity and probability of important detail was reasoned comparing the detail against the best star map to date of the Cahokia star map ref and the 35 star map cases listed here ref . This is how my research works and due to the law of statistics if a pattern keeps repeating itself over and over in remote cases then the more it occurs the higher the probability it is something quite probable and therefore real history. Before decoding the star map lets first put forward the most important detail in the sketch shown in the image below. This firstly sets out proving the hills were known as star correlations to the first people of this area. The sketch neatly portrays a defined group of hill shapes here when viewing the Tower monolith where it portrays its famous shape where the largest vertical riles on it are seen, viewed when looking in the direction facing west. I felt the first thing I needed to do was look for an image where one is standing in this position to match the terrain. I found one on an Instagram page (image credit Kevin Smith) where the photographer said it was taken near the road. This image is a pretty close match to the sketch and the angle used in the iconic movie 'Close Encounters'. Compare the two images. I am sure you will agree the hills here are the precise hills in contention for the star map correlation possibility. Márton also asked if I realised the Lakota star map sketch showed something I only recently fine tuned in the research of the Christ story and the Cross of the Churches as Orion. 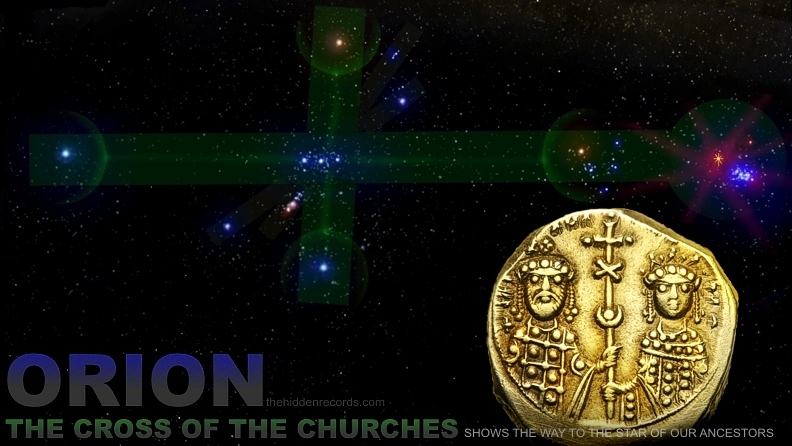 Recently I realised the Orion cross I proposed in 2002 for the meaning of the cross of the churches was basically the Constantine version ref of the Chi Rho using just the Orion constellation of Orion using Orion's Belt to find a sun star which is near the Pleiades constellation. Mouse over the image below to see the older more measurable and 'True' sky cross of the churches to work perfectly matching many earlier historical Christ illustrations is actually much bigger with more stars. The true cross of the churches I proposed in 2012 is made of a larger cross starting from Sirius through Orion's Belt including Aldebaran. This presents a sky cross where Orion's Belt rises vertically in the East and the cross is poised perfectly upright, unlike the smaller Chi Rho Constantine version where the cross is more of an X and slightly tilted. I found this greatest secret about the church explained the 3 Kings (Orion's Belt) follow from the east to find and follow to the Bethlehem star. (The Belt aligns and one follows line of sight skywards as it Orion's Belt rises with all 3 stars vertically) seen in this animation link here which was celebrated in most ancient civilisations as the womb of sacred feminine Creation ref . The sketch now can be deciphered piece by piece. 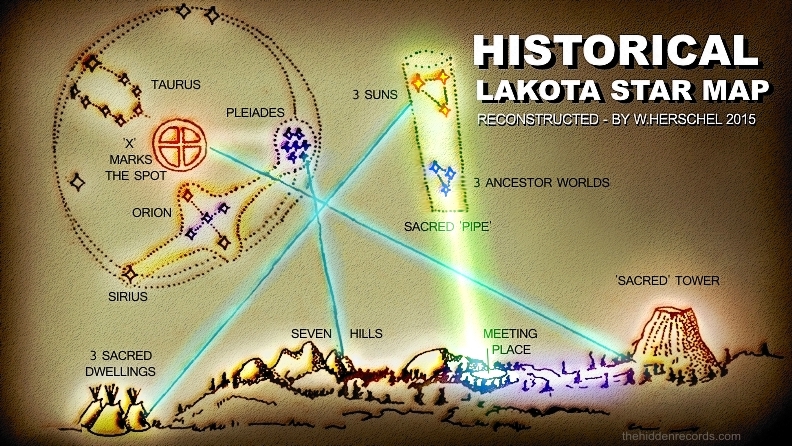 We have the hills identified in reality and the Lakota elders map correlates these with the Pleiades. 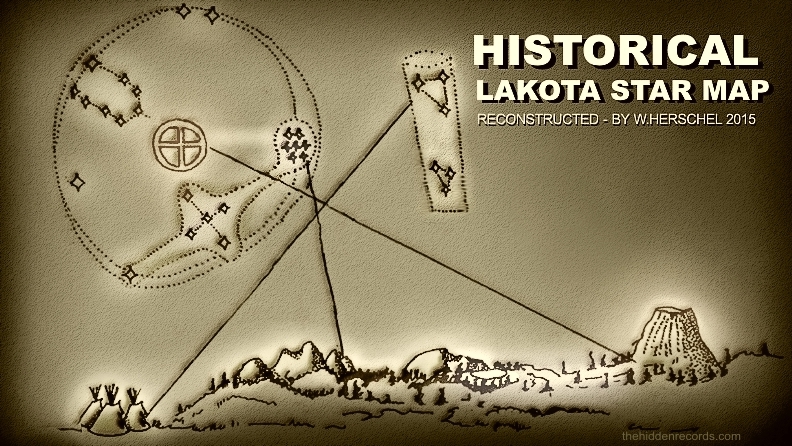 The second most important symbol in my research is the 'X' that marks the spot since this is what the map was intended for to show something special in the sky in relation to the Lakota people's ancestors. Since it is the highlight of the map where else would it be other than placement in the centre of the map! The map even uses the proverbial 'X' to mark the spot and circles it in typical sun symbol depiction too. The elders seem to be in dispute in this one as sketches show different interpretations and it looked like the original sketch had alterations. There is a general line from this symbol to the sacred rock monolith Tower and one could not imagine a more stunning 'monument' chosen for this correlation. In support of this reasoning of the original line drawn in correlation. I must reference one of the other interpretations of the Lakota sketch that places a Sun for this correlation with a blazing star and correlates it as Bear Butte which is another name for the monolithic Tower ref . 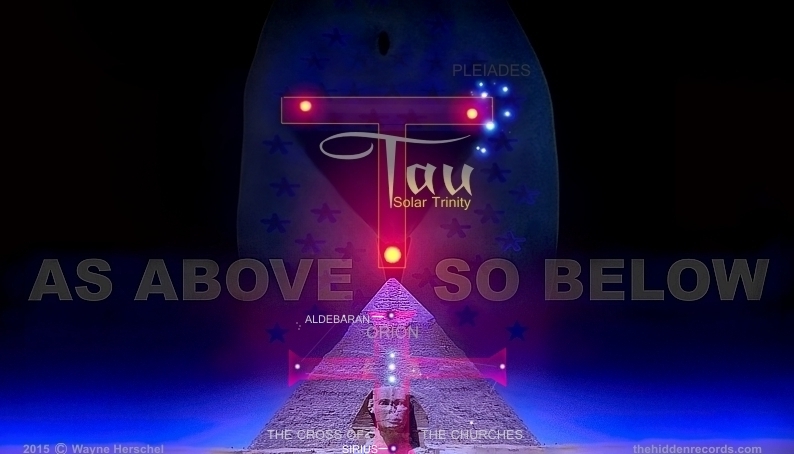 The next thing needing identification on the map was Taurus and it was missing between the Pleiades and the cross. Some sketches showed it as slightly displaced to make space for clarity of its central theme (like the Dendera disc of Egypt altered the stars slightly as its central more detailed Pleiades theme took a lot of space). My image below labels it and it as Taurus and it generally completes the star map with Pleiades and Sun star position orientation perspective matching all the other maps I have identified to date. ref . The triangle of three stars I believe is a teaching of the Solar Trinity ref found common in the other star maps I have studied but it seems oddly displaced right outside the round sketch which might once have been a drum skin record just like the Skidi Pawnee map ref . Now we arrive at the most amazing part of the star map. The part where it clearly explains how the star ancestors got here either in a colonisation event or to return again to teach the Lakota people about their origins. 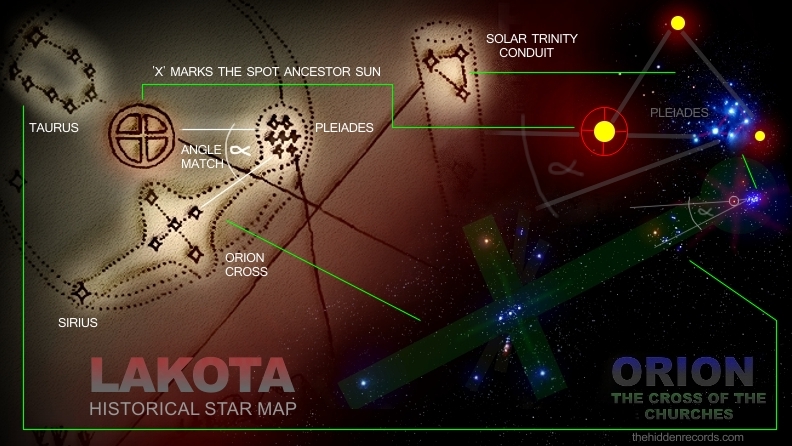 In the image above I have outlined the three sun stars that actually exist in astronomy ref identifying an extra depiction as a side note if you will next to the map to explain something about the contact event. The elders discuss this knowledge of a 'pipe' shape in a special star area but it was lost what the pipe refers to. This pipe description was exactly what I was looking for ref . Yes it was celebrated with a smoking pipe but its origin is all that matters here. What is a pipe from the stars all about. 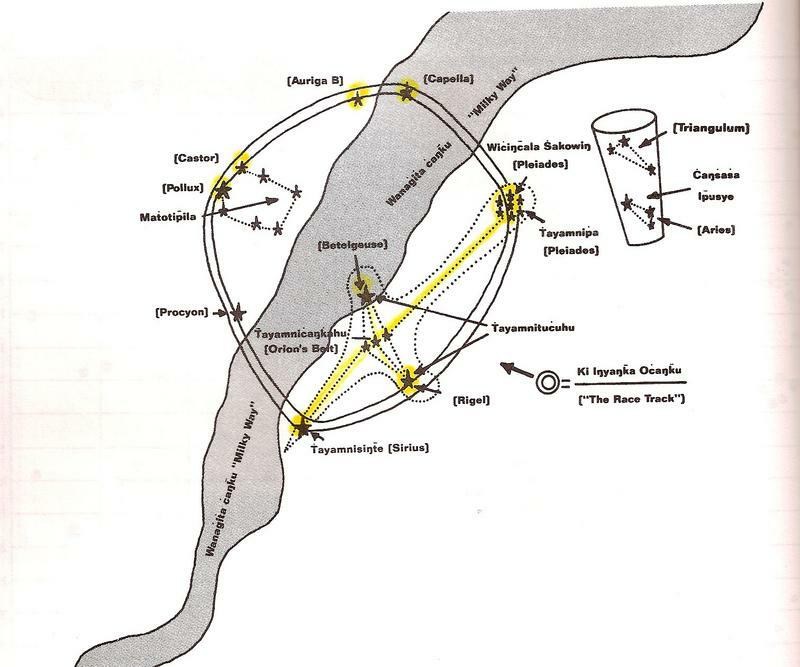 Márton found previously that several Native American tribes speak of the 'hollow reed' or 'bamboo', a mythical conduit that helped them to travel to this world in the ancient past and which has been marked by a symbolical hole in the middle of their Hopi Kiva lodges, knows as the Sipapu portal hole ref . This fact alone also proves my pipe theory here and thus places it literally on solid ground! Now the Lakota pipe placement position needs reasoning. Note how it is slightly tilted. If you follow the pipe down to the ground it aligns with the ceremony area I label as the meeting place. First contact. The place by 'coincidence' is on the west side of the Tower monolith rock where the Spielberg movie placed the landing place site for first contact. In the image below you can see the alignment. For me this is the cosmic conduit wormhole we find common in the other star map stories, especially in Egypt ref . They probably arrived using the global common celestial ship claim with a cosmic wormhole means of traversing space and this will be discussed in the conclusion. The sketch has the triangle of three stars with correct orientation with Egyptian cosmology of the sacred womb of Creation correctly too ref . Now taking this reasoning further the sketch adds another smaller three stars in triangle below it and for me this depicts the three ancestors planets... exoplanets that fit with each of the three sons. Completing the reasoning in typical ancient cultures they built three places on the ground to correlate the 3 suns if you follow the alignment line. for me in this study of star map common findings around the world I first began only considering man made hills as mounds or Pyramids or Temples or monuments positions only to be taken seriously in measuring 'As Above so Below' legend interpretations. But then along came Rome and the seven hills correlating as Pleiades chosen for a close match to the star map template. I never included Rome in my book as I felt uncomfortable with natural hills in any correlation theory. It simply cant ever be a good correlation can it? But Rome had a good correlation story and so it became a story in 2005 on my website ref . Márton Molnár-Göb my Hungarian researcher colleague then found star map Athens ref where hills were a great correlation in support of the star map findings we have to date. Márton then said something that made a lot of sense to verify how we should really take the natural hill correlations more seriously. I mean how on earth would the ancients find such great natural correlations in nature? One really has to be in the sky looking down to find them in the first place. The reasoning is most likely quite obvious. Building monuments is one major time consuming project. How great it would be if one can set out and look for a natural hill area from the sky and lead people to these sites to build their cities and to celebrate the star knowledge that will not be forgotten. Is it not obvious the visitors from above... our star ancestors chose these rare natural hill sites for their people visited in first contact! 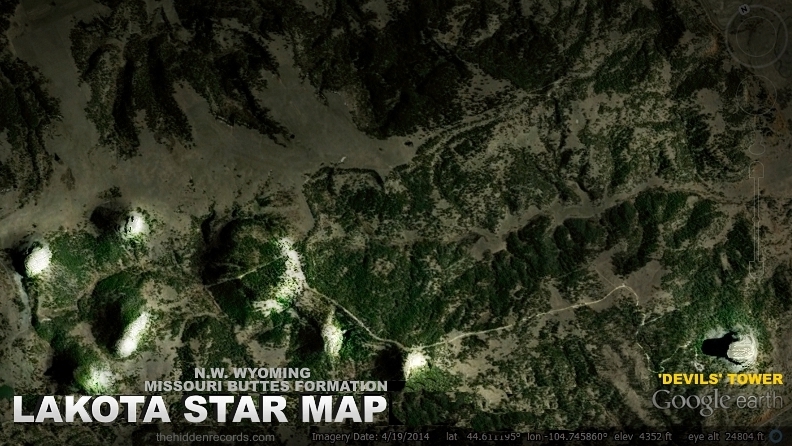 I went onto Google earth and set the 3D relief enhancement and set my view to fly around the hills in cyber space. I was dumbfounded to see what I was seeing! This set of hills turns out to be one of the best unique and rare single remote clusters of hills to match the Pleiades. 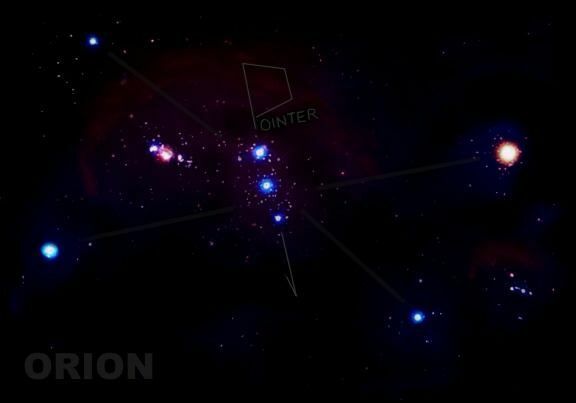 Mouse over the image below to see how exceptional the star correlation appears. The stunning rock monolith 'Devils' Tower correlates as the Sun star position too... not perfectly but in a way that is so close one starts to think stupid things like maybe aliens were able to form the hills like this, but that is so extreme and unlikely for me. How on earth was this sacred rock monolith named as 'Devils' Tower you might wonder? I think its name was an intentional cover up of its meaning and value to early American elite settlers who had their very own matching knowledge to this very same star secret ref . They obviously did not consider the Lakota as equals so their ancient knowledge would probably be demonised or covered up. Coincidently some will say the military Colonel who first claimed the meaning said he 'thought' his Lakota interpreter said the monolith was called 'Bad God' Tower so he felt the best name fit here could be 'Devils Tower' ref . Now lets be reasonable here. How can I claim this as a cover up? Logic and reasoning reigns above all and we need to see the obvious. The Lakota interpreter would have shown some sort of emotion to this site both with his choice of words and physical expressions. There is not even a chance in a million such a misunderstanding could be possible here at all. Sadly the first settlers excuse to take land from these people was to use the excuse these people were evil heathens and not equal at all to the colonists from Europe who invaded. I have used the term 'Devils' Tower with the words in inverted commas to provoke thought and hoping the people of this area enforce an official name for the Tower to something more sacred and it will be an honour if they succeed to change the name here in this article accordingly. Consider the most famous UFO seen in this part of the world is the Phoenix Lights sighting of a massive V shape mile long craft which I document in great detail in the prophecy study link here . The placed position of the 'meeting place' is positioned west from the Tower so like in the movie they would be watching the Tower in the east. The Pleiades will rise from the east and seen directly placed above the Tower. 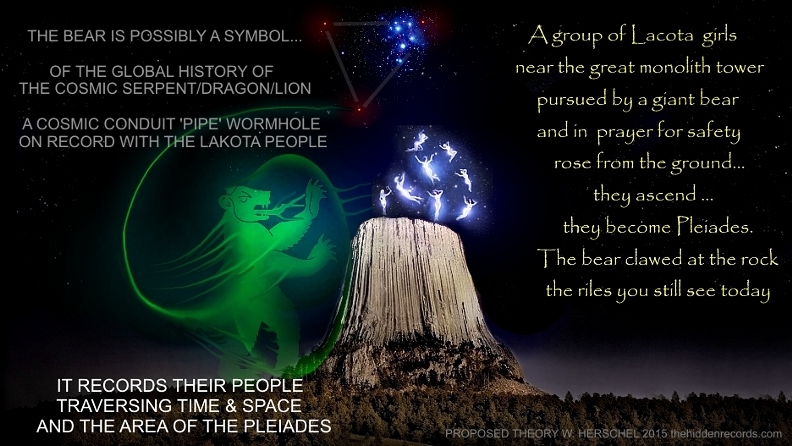 This is no coincidence so the Pleiades will be correctly positioned for learning ceremonies of the pipe and the ancestors. It will be in its correct Egyptian 'Leg of the Bull' upright position and the triangle arrangement of 3 suns correctly identified as a triangle pointing down. Now if legend is true a sacred cosmic conduit 'pipe' opened up from this star area, they would see this 'pipe' from their meeting place and it would no doubt open up allowing the most amazing celestial ship to appear. Just as the people who are the ancestor lineage of the Lakota and ALL humanity could land and ... this was perhaps the best case so far of... first contact. Mouse over the image to see the 'pipe' explanation animated.